Amr Shabana pulled of a stylist and confidence boosting win in the Qatar Classic when he beat the third seed Gregory Gaultier 11-4, 8-11 11-6, 11-5 in 52 minutes to move into pole position to regain the world title in Bermuda. It was all easy for Shabana in the first, although later he was to say ‘we were both nervous’, but he played straight length and picked his winners with ease taking the game with seven winners to Gautlier’s none. The difference between Shabana’s play and those of his colleagues who are fine attacking players, and who work the ball well, is that Shabana finds the nick with ease. Drops are not hit to the front corner but aimed for the nick and roll regularly. The nicks rolled easily enough for him in the first 11-4 but he lost his way at the start of the second. Gaultier was off court disputing a stoke against him, with some justification, at the start of the second and one suspects that Shabana’s concentration just faltered a bit. He played well, his hitting his there, his anticipation brilliant, nimble in movement, beautiful variations of pace and shot but at times he makes it too complex, and at times his concentration goes. Overall this was a good performance and if you wanted to criticize it you would say that mentally his performance fluctuated a bit. Gaultier came onto his game in the second started to find a few winners as Shabana’s length became indifferent to go ahead 6-3. Shabana leveled with fine kills but mistakes on easy balls and a harsh stroke disrupted his concentration for Gaultier to level the game scores. The crux of the match was in the third. It was all very tight at 5-all. Gaultier was impeded by Shabana received a no let, he disputed, was ordered to play on, and with several excited crowd outbursts during rallies (Gaultier fired the ball into the roof on one serve in frustration as he asked for a let for distraction) his concentration was disrupted and he was unable to score again except for one nick smashed off serve in frustration. So it was 11-6 to Shabana to go 2/1 up. Gautlier’s mental demeanour did not improve in the fourth. He imploded mentally briefly at 1-3, with a whole series of errors that put Shabana ahead 8-1, out of reach, and the match was finally secured 11-5 in 52 minutes. This was a fine match for Shabana. He can play better but it is all there. The hands and feet are working well. The head is not bad and if he gets that together someone will have to play very very well to deprive him of a world title in Bermuda. The tour now moves to Hong Kong, with an event in Pakistan and then Bermuda. Shabana is the form player at the moment but there is still some way to go. “In Hong Kong we start again, another fight, another war,” said Shabana. The war will be over in Bermuda in December, briefly then there is the world team title to play for. Nicol David won the women’s title in Qatar 9-6, 9-4, 10-9 to go back to the top of the women’s game. In truth she could have won it more easily but gave Grainger an opening on game ball. Grainger play fluctuated. She was 6-4 up the first and lost it quickly in a hand. It was close at the start of the second but David established a 6-2 lead catching her opponent out with boasts and saw the game out 9-4. At 8-3 up in the third is had been largely one way traffic but then unencumbered Grainger started to play brilliantly and suddenly David realized she had not won it. At 9-8 game ball after much good work Grainger muffed a really easy drop opening and David went through 10-9. Not quick a world title but she and all her Malaysia fans were very happy. 9-7, 0-9, 2-9, 9-5, 9-1 (56 min). Natalie Grainger  beat Tania Bailey  1-9, 0-9, 9-6, 9-4, 9-1 (60 min). 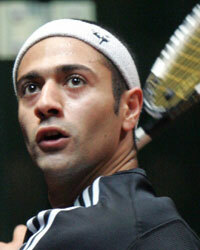 Amr Shabana  beat David Palmer  11-6, 11-5, 11-6 (47 min). No one had the gumption to go and ask David Palmer what he felt about his chances of hanging onto his world title in Bermuda after his semi-final against Arm Cabaña but the Egyptian had sent him a pretty clear message here in Doha. ‘That title is mine,’ Cabaña could have said. It was a classy performance from the world no.1. Today he had another gear to the world champion and completed his destruction with ease – deadly kills, not fine drops but deadly drops that nicked, straight and crosscourt, that gave you no change no matter how hard you ran. It was annoyingly easy for him, and even when Palmer momentarily got on top and smashed the ball into space eh was able to run it down or flick it off the back and then conjure some little piece of magic and baffled his opponent. The score says it all 11-6, 11-5, 11-6. It was survival rather than revenge at the Kalifa Squash Centre in Doha in the semi-finals of the women’s event at the Qatar Classic when Nicol David turned a disasterous position around in the fourth game to defeat Rachael Grinham, the player who has taken her British Open and World titles. David took the first 9-7 but then lapsed into a type of passivity, almost mesmerized; as her opponent took control of the game with brilliant floated lobs and drops. The second went quickly 0-9, the third almost as quickly as her opponent struck with exquisite straight drops and intercepted volley drops, interspersed with fine variations of faded crosscourt drops and volley drops and high floating lobs from the forehand. Whenever David ventured onto the forehand Rachael Grinham struck with winning straight drops or floated crosscourt. In truth there was plenty of opportunity and Grinham used them superbly as the world no.1 struggled to get length, apply any pressure on the volley and ventured short with telegraphed shots far too often. Harsh to say but true. Grinham canned her. For half of this five set match – from the beginning of the second game until half way through the fourth David scored just three points! How did he turn it around from 2/1 and 5-1 down? Well as she said later she didn’t give up. “I new I had to keep pushing. I was a struggling. Her shots were unbelievable. She was working the court so well. All of a sudden we were at 5 all and I kept that momentum and carried it into the fifth. David did get better length – really this was poor for a world no.1 – she volleyed more to get the middle and tried to keep in front. She still went short far too often but now Grinham was speeding to the front from further back in the court and David had made the commitment to stand up the court further. “It was cooler on there today so Rachael’s shots died well. I hadn’t adjusted,” said David. The air conditioning level has been crucial for this event. Not high enough to absorb enough moisture to stop the floor becoming slippery as Palmer complained and Ramy found out, but not high enough to provide a bouncy ball that David could wack into the back corners. Once David had adjusted and got to 5 all in the fourth Grinham’s game fell apart. She only really adjusted when matchball 8-2 down, when she controlled a superb long rally, and didn’t take any risks – she could not afford to – but it was a bit late for she should have tried to build rallies earlier rather than counter punching from unlikely positions. A fine kill from David and an unfortunate stroke and it was all over 9-7, 0-9, 2-9, 9-5, 9-1 in 56 minutes. US champion Natalie Grainger celebrated her long-awaited 'world top three scalp' when she defeated Australia's world No2 Natalie Grinham in straight games in the quarter-finals of the Qatar Classic, the $77,000 women's WISPA Gold squash event in Doha, Qatar. Egypt's Karim Darwish pulled off his second successive upset in the men's championship when he removed fifth-seeded Frenchman Thierry Lincou to reach the semi-finals of the $120,000 Super Series Platinum event. It is more than a year - and 14 events - since Natalie Grinham last failed to reach a WISPA World Tour semi-final. But last week's Madrid World Open runner-up, unbeaten by Grainger for two and a half years, went down 9-7, 9-5, 9-4 in 35 minutes to the Pan American Games gold medallist in just 35 minutes. The former world number one from Washington DC now faces England's Tania Bailey for her first appearance in a WISPA Gold final since April 2005. Bailey, the fourth seed from Lincolnshire, maintained the brave form she showed in Madrid to beat Vanessa Atkinson, the No8 seed from the Netherlands, 7-9, 10-9, 9-1, 9-2. World number one Nicol David will face world champion Rachael Grinham in the other women's semi-final. David, the top seed from Malaysia, despatched England's 12th seed Alison Waters 9-7, 9-1, 9-2 while Australian Grinham claimed her 16th WISPA Tour match win in a row when she recovered from a game down to beat England's No6 seed Vicky Botwright 1-9, 9-5, 9-3, 9-5. After upsetting second seed Ramy Ashour in the previous round, Karim Darwish took full advantage of his surprise appearance in the last eight by surviving an 85-minute marathon against Thierry Lincou to beat his French rival 11-5, 11-7, 8-11, 9-11, 11-9. "It's always hard to play against Thierry, he is so strong mentally and physically," Darwish said afterwards. "In the first two games I was confident, relaxed, and it was a bit comfortable. Then at 8-4 in the third, I starting thinking that I was winning, and that, I shouldn't be against somebody like Thierry! "But then, after losing the third and the fourth, I reminded myself of the match against Shabana in Saudi, where I was up 2/0 and I lost. And I knew that I couldn't lose another match like that, it would have killed me. "We both couldn't move at the end. It could have gone either way, but I'm so glad to be in the semis." The 26-year-old from Cairo will take on Lincou's compatriot Gregory Gaultier, the British Open champion who survived another marathon against US Open champion Nick Matthew to beat the Englishman 11-10 (2-0), 9-11, 11-10 (2-0), 6-11, 11-9. The other men's semi-final will feature Egypt's top seed Amr Shabana and third-seeded Australian David Palmer. In the only straight games win of the day in the men's event, world number one Shabana eased to an 11-8, 11-7, 11-7 win over unseeded Malaysian Ong Beng Hee while world champion Palmer toiled for 74 minutes to overcome Englishman James Willstrop 4-11, 11-7, 11-7, 3-11, 11-8. "When you play James, you know you just have to play the ball and concentrate on your squash, and I think that for big fellows, and the way we move around the court, and the way we play, so early on the ball, we are moving around each other quite well!" explained Palmer later. "It's for that kind of match that I keep on playing squash. There was no discussion, no blocking, no getting in the way of each other, no arguments with the referees, a good, fair and square match. And if I was James right now, I would be very, very unhappy." Willstrop concurred: "I was so up for this match, I so wanted to win. I am really really, really, unhappy. I'm very disappointed, but all credit to both of us, it was a fair game of squash, no messing about. "In an hour or two, I'll look at it in a positive vein, and take the positive out of it - I played well in patches. There is some good; I only lost 11-8 in the fifth. But it's a quarter final. I don't want to keep losing in quarter finals, I've got to learn, and learn, and learn how to win those matches!" 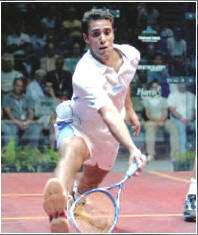 Ramy Ashour crashed out of the 2007 Qatar Classic, at the Khalifa Stadium in Qatar, with a twisted ankle that has stalled his sensational assault on the top spot in world squash and raises doubts over his participation in the World Open in Bermuda at the end of the month. Ramy, who has had difficulties with a long-term knee problem played throughout the recent Saudi Open with a ankle brace. 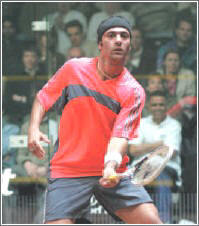 He reached the final there but lost to the World No.1 Amr Shabana. 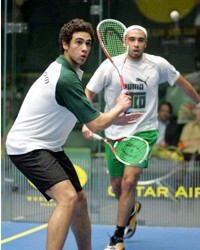 Ramy who staged his assault on the top spot with wins in the Kuwait Open in April, the rescheduled 2006 Qatar Open also in April, and won the Super Series Finals in August, faulted in the US Open where he lost to Nick Matthew in the semis and in Qatar he has crashed out in the second round. Ramy was comfortable enough in the first round against Chris Ryder in Qatar winning 11-6, 11-4, 11-10 (2-0) to go through and face his compatriot Karim Darwish in the second. Against Darwish the first game was desperately close with plenty of all court action but both players ended up on the floor on separate ocassions with the floor-sweepers on court frequently. Darwish was the first to 10-9, in the fast action packed game with plently of close contact – their were 17 lets and no lets in this game alone. The scores levelled at 10, 11, 12 and 13 before Darwish sealed what proved the decisive encounter 15-13. In the second Darwish could do no wrong, was away to 8-1 and then 11-2 as his opponent let the game go. In the third Darwish again set the pace with a 4-1 lead closed down by Ramy to 4-5 but he then slipped, maintained his balance but retired in pain in powerthe 41st minute.. There was much constination and Ramy was in genuine distress. It is too early to say how serious the injury is but it cannot but affect his preparations for Qatar. It also raises doubts over whether he will play in next week’s Hong Kong Open. Earlier in the day David Palmer slipped on the blue painted floor of the Khalifa Stadium show court and requested that the air conditioning be turned up immediately to absorb some of the moisture in the warm air. The World Open is to be held later this month. 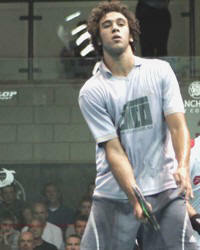 Ramy Ashour, the 20-year-old Egyptian who had reached at least the semi-finals in all nine PSA Tour events in which he had competed so far this year, crashed out of the Qatar Classic after retiring injured in the second round of the $120,000 Super Series Platinum squash event in Doha, Qatar. The second seed was stretched to a lengthy tie-break in the first game, then only managed two points in the second against compatriot Karim Darwish, the No9 seed. Already carrying a minor wrist injury, Ashour crashed to the floor midway through the third game clutching his left ankle - immediately taking off his shoe and clearly in considerable pain. Darwish's 11-10 (5-3), 11-2, 5-4 (ret.) victory takes the 26-year-old from Cairo into a quarter-final against fifth seed Thierry Lincou after the Frenchman beat England's Joey Barrington 11-4, 11-5, 11-7. Ong Beng Hee maintained his giant-killing Doha run by beating Egypt's No8 seed Wael El Hindi 11-8, 7-11, 11-10 (2-0), 9-11, 11-10 (4-2) in a 112-minute marathon. 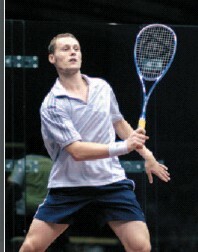 The unseeded Malaysian had earlier upset 10th seed Stewart Boswell to reach the last sixteen. "This was my lucky day today, I was match ball down, and I win," Beng Hee said. "A bit stop-and-start all the way, but I’m happy with my win, very happy!" Beng Hee now takes on top seed Amr Shabana, the world number one from Egypt who defeated compatriot Mohammed Abbas 7-11, 11-10 (2-0), 11-5, 11-7. In the women's $77,000 WISPA Gold championship, Alison Waters brought the giant-killing run of unseeded Jaclyn Hawkes to an end - beating the New Zealander 9-0, 9-5, 9-2. In only her second WISPA Gold quarter-final this year, the No12 seed from England now faces top seed Nicol David. In a repeat of their first round match in last week's Madrid World Open, the Malaysian world number one beat France's Isabelle Stoehr 9-0, 9-7, 9-4. "I started well, I found it good watching Beng Hee playing before as when I found out he won I had an extra bit of motivation from the start," said David. "I'm pleased with my match today." There were surprises in both the men's and women's events in the Qatar Squash Classic on the opening day of main draw action in Doha, Qatar. 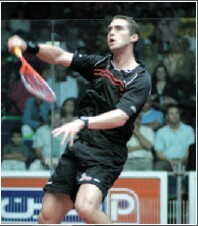 Australia's Stewart Boswell was the highest-ranked player to fall in the men's $120,000 Super Series Platinum event. The tenth seed from Canberra took the opening against Ong Beng Hee, but the unseeded Malaysian fought back to clinch a notable 9-11, 11-4, 11-8, 7-11, 11-4 victory in 72 minutes. Beng Hee's win was countered by the unexpected defeat of compatriot Mohd Azlan Iskandar. The No14 seed was forced to retire injured at the start of the third game against unseeded Joey Barrington, with the Englishman claiming an 11-5, 11-4, 1-0 ret. win after just 29 minutes. Barrington will now face fifth seed Thierry Lincou after the Frenchman survived a scare against English qualifier Bradley Ball before winning 7-11, 11-4, 10-11 (1-3), 11-8, 11-8 in 87 minutes. "I'm lucky to get away with a victory today," said former world number one Lincou said. "It's a great warning for the rest of the tournament." Dutchman Laurens Jan Anjema also secured an unexpected place in the last sixteen. The 24-year-old from The Hague stemmed a comeback by 11th seed Lee Beachill before upsetting the Englishman 11-7, 11-9, 4-11, 7-11, 11-9 in 84 minutes. Jaclyn Hawkes was the heroine in the $77,000 WISPA Gold championship. The 24-year-old New Zealander celebrated her return to the world's top 20 by defeating seventh seed Omneya Abdel Kawy 2-9, 9-0, 4-9, 9-4, 9-4 in 61 minutes. Hawkes will now face England's 12th seed Alison Waters, a 9-3, 9-2, 9-3 victor over Pakistan qualifier Carla Khan. Malaysia's top seed Nicol David began her Qatar campaign in confident style. Putting the disappointment of last week's second round World Open exit behind her, David despatched Mexico's Samantha Teran 9-3, 9-3, 9-3 and will now meet France's Isabelle Stoehr in a repeat of last week's first round clash in Madrid.